The Center for Disease Control and Prevention (CDC) plays many roles in the nation's health. One of those roles, as outlined by the CDC itself, is "promoting healthy and safe behaviors, communities, and environment." On Friday, the CDC definitely communicated with the populace, and people were justifiably grossed out. The Center posted a poppy seed muffin with five ticks hidden in it. Hopefully, it's just Photoshopped because this tick-strewn poppyseed muffin is a terrifying thing to behold. It's hard to know why you'd have to tell the difference between a poppy seed and a tick. Presumably, you wouldn't want either just hanging out on your body uninvited. Yet, there it is. The tweet produced intense reactions, which might be what the CDC was looking for. It maybe didn't effectively communicate "how to prevent tick bites," but it definitely made people aware that ticks can be small. Swearing off the lemon poppy seed muffins forever. Now tick muffins. Great. Now can you do this with all the other high carb foods I should avoid forever? Instructions unclear, went to the store and set fire to all the muffins. Important issue, but I think this photo tweet probably sounded better in the meeting. Also, did you ruin a perfectly good muffin? 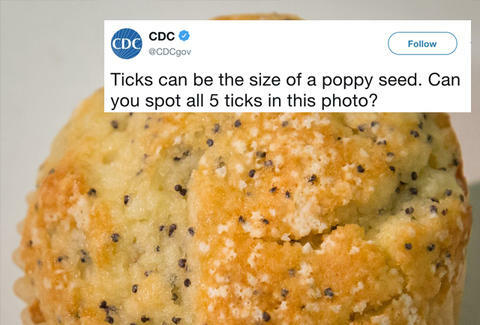 Even if the CDC ruined poppyseed muffins for you, their intentions were good. As the weather changes and more people head outdoors, the CDC has issued warnings about the increasing number of communicable diseases carried by mosquitos and ticks. A recent report from the CDC noted the number of disease cases from mosquito, tick, and flea bites tripled from 2004 to 2016. Also, nine new germs spread by mosquitoes and ticks have been discovered or introduced since 2004. So, while the attention may have been on the disgusting muffin, the link the organization shared about preventing tick bites deserves as much if not more intention than their Where's Waldo with ticks.